Cinematic Paradox: Do They Think We're Immune to Life? Do They Think We're Immune to Life? Starring: George Clooney, Shailene Woodley, Amara Miller, Nick Krause, Patricia Hastie, Beau Bridges, Judy Greer, Matthew Lillard. One of the things I don't like about awards season is that there are films that are big hits, getting lots of nominations and stuff and becoming everyone's favourite movie. Then awards season ends, and those movies are forgotten about. 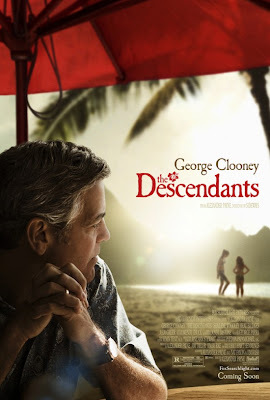 The Descendants is one that I feel will become that way. It is getting a lot of buzz, even winning the Best Motion Picture - Drama award at the Golden Globes and numerous accolades for the lead, George Clooney. Yet, while everyone is quick to shower love upon this movie, I am a little more hesitant. Maybe it is because I haven't seen an Alexander Payne movie before, so I'm unfamiliar with his 'easy breezy style' of making movies. The thing is, I just don't know why this movie didn't do anything for me. I might be unpopular in the blogosphere - but this is what the lady sitting next to me said as soon as it finished: "that was so overrated. 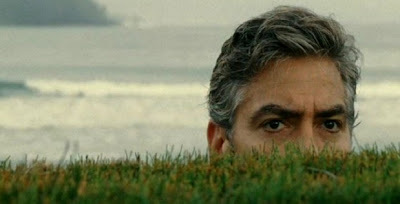 If George Clooney gets the Oscar this year, it will be such a disappointment. Now Ryan Gosling was fantastic, he should definitely win. He was way better in his movie." I was going to intervene and give her a lecture on how the Gos is unfortunately going to miss out this year because of all of the competition, but I said the exact same thing to my Dad (minus the Gos part). Which made me feel bad, but since I'd just watched a movie that lives and breathes honesty as a way of combating lies (and maybe all feeling), it only felt fitting. 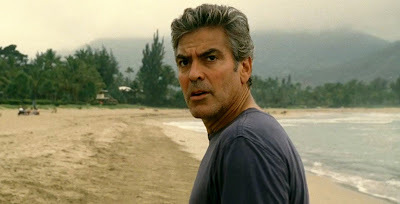 The Descendants is my favourite breed of movie: the 'what if?' movie. These are films that takes a normal situation, with normal people, and puts a twist on it that makes it difficult to deal with. Here, Matt King's (George Clooney) wife has been put in a coma after a boating accident. He has to now deal with his two distant daughters, the slightly strange 10 year old Scottie (Amara Miller) and rebellious 17 year old Alexandra (Shailene Woodley). When the latter arrives home, Matt discovers that his wife was in fact cheating on him. As she can't tell her side of the story, given her condition, Matt sets out to find the other man. And all this happens while he is trying to decide what to do some expensive and prosperous land he owns which could be used for development. What I liked about the simple storyline was this: Matt's wife has been put in a coma, which must be fairly traumatising and hard on him. But what is even harder is that while he is fighting to keep her alive, she was unfaithful to him, so is there really a point? It is the ultimate battle between emotions and morality...a battle that I like to see fought on film. Despite how much I loved the story, the emotions and the morality behind it all, The Descendants just turned out to be quite average for me. I felt like there was nothing I could take away from it. While I'm sure that Matt trying to find his wife's lover so he could say goodbye would be a realistic thing to do, it didn't really translate well to film. I would have been happier if there was more effort put into the climax of that story, or the meeting between the two was flagged altogether - the moral issues were more interesting to me, but admittedly, they wouldn't have made for an interesting film. Still, there wasn't a lot of catharsis, or even a hint of sentimentality in the situation, and there was cynicism that was like acid, making it quite confusing to pick up any sort of message. I know the film's main ambition was to strive for honesty. And in some ways, it did manage to do that (for one thing, I did enjoy the lack of sentimentality for most part, but I would have liked a bit of sentiment, just towards the end). In others, it felt like it was trying way too hard to comment on the failings of society - especially with that little girl that Scottie hung out with. The honesty in the emotions were mostly really good, but the honesty in some of the characters and the things they did was not. But at least Alex wasn't a phone crazy, always on the internet, says all of her problems in a blog kind of girl. Alex, in fact, was a great character, brought to spectacular life by Shailene Woodley. I must admit, before seeing this movie I was confused by all of the love for Woodley's performance as I only remembered her from The Secret Life of an American Teenager (which she's good in, but it is such a mediocre show). What she does here, though, is not let her character succumb to the usual 'I'm a rebellious teenage girl' stereotype. She created a layered character who has her fair share of problems, but she lets them boil up inside of her like so many other teenagers do. Just watching her relationship with her father was so interesting - she and George did marvellous work of creating that. One actor that does let his character succumb to the usual 'I'm a slacker' stereotype is Nick Krause, who plays Alex's boyfriend/friend, Sid. While this character did get a lot of laughs, he seemed to just be there for the occasional comic relief and a whole lot of dumbass comments. If he was supposed to be representing how stupid and honest teenagers can be, he failed. He was just really offensive, and Krause was trying too hard to be a slacker by being spaced out to the point I'm sure there was nothing in his head...and that kinda offended me, too. Was he really necessary to the story? My answer is no, not at all. George Clooney has been getting a lot of acclaim for his performance, but as I've said, I'll be quite disappointed if he wins Best Actor this year. Don't get me wrong, he is really good at showing the emotions and desperation of his situation, but nothing he did really stood out for me. It was Judy Greer who really stood out as the sweet, loving wife of an unfaithful husband, and who broke my heart in her final scene ("I forgive you even though I should be really angry at you!") In fact, that was the scene I had been waiting for in the whole movie - for someone to actually show the complex situation through catharsis. However, like Clooney's performance, nothing in the film stood out for me. Much to the point that I honestly can't remember that much of it. Maybe I'll like it more when I watch it again. But for now, I'm just going to have to feel bitter if it wins big this award season, or wonder why I didn't like it like everyone else, or feel extremely guilty for not rating it as highly as just about everyone else I know. Which means I might have to go into hiding...maybe in Hawaii. Even if they're not immune to life there. Interesting. I think Woodley was my favourite part of the film. I for one did think that Clooney was rather good, but man she was just brilliant. I really loved Judy Greer too. I completely agree with you on the point that if this film wins the Oscar, it will fade into oblivion. It's good, but not that good. Something like Sideways sticks with you, but The Descendants is just fading away in my head. even if- just had to make that clear. I don't think it has any lasting effect. I don't think it will have a lasting effect at all. I think that's what you can say about most of the films that have come out this Oscar season - it is the ones like Drive, maybe The Girl with the Dragon Tattoo or maybe even Shame (and definitely HP7PT2) that will have a lasting effect, and they won't get many nominations. Ah well, that is the way Oscar season works. I so want to see this. Unfortunately it is not out here yet. I am sending one of my writers to a press screening tonight to see it. So will have a review soon, just wish i could see it myself. I am very curious to see this one, but it looks to me, as you said, mediocre, a simple story, with drama and emotional delivery, but still nothing that can shake up. Maybe I'm wrong...I hope I am, cause I will be pissed if Clooney wins instead of Fassbender, who is fantastic in Shame! Great review! I wish Fassy could win - and I haven't even seen Shame! I just think that in the scheme of things, if Fassy can do what I've heard he does in Shame, and George Clooney gives a very there's-nothing-different-about-this performance, then we know who should win. There are better male performances out there this year - sorry Cloon. I definitely liked this film more than you did though I can see why it probably confused you. To me, it stands along with Payne's fascination with flawed individuals who often go through some existential crisis or a personal one. I would recommend checking out my Auteurs piece on Alexander Payne. It would give you a chance to help out on where to start and such. He isn't for everyone which I can understand. Yet, he is a filmmaker whose work I truly enjoy. I will definitely delve deeper into Payne's filmography - thanks for the tip! Wow you must be the first person I read who was disappointed by this ah! I'm waiting for the DVD to rent because I just don't feel like going to the theater for it. I know - I actually may have bumped the rating up a little just because of that fact, haha! You'll like it more than me...I'm alone down here! I've read at least one other reasonably damning review of it on my blog rounds, so it's not just you. I read a few on IMDb, but not from the blogging community. I should dig a little deeper, so that could make me feel better. I'm generally with you. I liked 'The Descendants' but am shocked by the number of accolades it's collecting. I'm down on 'The Artist' in a kind of similar way to what you're expressing here (though, I'm really starting to just flat out despise that particular film): these are exactly the sort of movies we'll have trouble calling to mind in a few months but, right now, everyone suffering from a case of SADD thinks they're the best thing around solely because of a bit of optimism. I'm starting to wonder if maybe they shouldn't consider pushing the Oscars back to like May, or something. I have a theory that the heavier, more ambitious, more "depressing" movies may have a stronger shot if more of the voting parties weren't suffering from a lack of sun. Ugh. 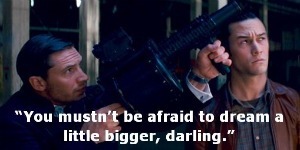 Fassbender for the win. Interesting that you didn't like The Artist - but I think there is a bit of overkill surrounding it. And yeah, I'd like to see him win, and I haven't even seen the film! The only thing worse than boring and implausible screenplay was the music in this movie. Same tune, over and over. I hated the characters and the whole thing was a waste of time, Clooney was good, but it's not even his best performance. It's insane if he wins Oscar. There are at least 4 people this year that deserve that win more than he does. THANK YOU! Someone else who doesn't like it all that much! And yes, if Clooney wins, it will be madness.